Fireside Collective in concert at the Mustang Music Spring Jam. A great weekend last weekend. The highlight had to be Mike Dianna’s Mustang Music Spring Jam up in Corolla. 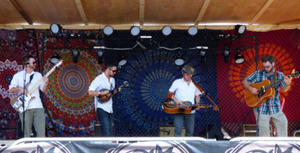 A day of wonderful music capped off with New Madrid, a group who is putting southern rock back on the map. Innovative music too with the top award for innovation going to Asheville’s Fireside Collective. Playing classic bluegrass instruments-except for the electric bass-they tore in to some classic rock ‘n’ roll songs and were great. They did some classic bluegrass as well, but there is something about hearing the guitar lead from Johnny B. Goode played on mandolin that creates a permanent memory. The highlight of the day, though, had to be the kids of Mike Dianna’s Mustang Music Outreach. Working with local musician, amazing guitarist and teacher Ruth Wyand, Mike has been supporting lessons, helped to find place to teach and created an environment where kids can learn how to perform. And it all seemed to come together at this year’s Mustang Music Spring Jam. From an opening set that included Beatles and Rolling Stones numbers to closing out their time on stage with Bruno Mars’ Uptown Funk, the kids showed what happens when they’re challenged and they accept that challenge.